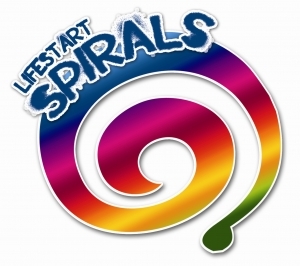 The Lifestart Spirals Programme is an innovative, strengths-based, group parenting programme designed around the specific needs and lifestyle of young parents with children from pregnancy to age 3 years. 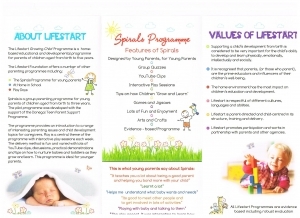 The aim of the programme is to empower and support younger parents by providing them with key information, skills and confidence that will help them nurture their children as they grow and learn.Spirals sessions can be delivered either by Lifestart personnel or family support workers who have been trained by Lifestart. This enables partnerships with other organisations and facilitates a collaborative approach to supporting young parents within a community. The programme is delivered through group sessions and incorporates quizzes, music, YouTube clips, practical demonstrations and interactive ‘hands-on’ play sessions. These are used to reinforce learning in relation to key developmental concepts. 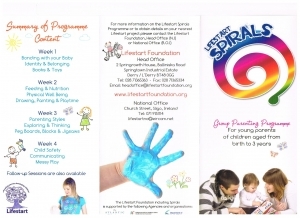 The measurable outcomes from the spirals programme has included confident and informed young parents who can positively engage with informal and formal networks, and be active participants within their communities. The programme has also been shown to improve the young parent’s self-efficacy as measured in a number of areas including relationships, enjoyment, setting boundaries, self-acceptance and learning. Outcomes also include children who are healthy both physically and mentally and are being supported in active learning by their young parents. These impacts have been measured using a validated pre-and-post programme evaluation tool specifically designed by University of Hertfordshire. A two day Train the Facilitator programme is also available for organisations wanting to deliver the programme.